iMovR launches its new Freedom desks, an American-made standing desk line to compete with the barrage of cheaply-made imports on the market. The Cascade model features iMovR’s innovative SteadyType™ technology – a built-in tilting keyboard tray for unparalleled typing ergonomics. Standard free shipping in the continental United States. Additional charges for AK, HI, Canada. DHL available for international. All iMovR desks are made to order and shipped within 5-7 business days. Add up to 5 business days for freight delivery to anywhere in the continental US. 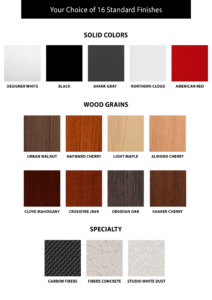 Available standard woodgrain colors for the desktop include Mahogany, Hayward Cherry, Shaker Cherry, Almond Cherry, Light Maple and Urban Walnut, while Black, Designer (frosty) White, Warm White (beige), Haute Gray (putty) and a stunning Shark Gray are the available solid colors. Base legs are available in silver, black, or white. Standard Base: 26.8" - 45"
XT Base: 22.4" - 48.5"
100% American-made quality, built-in SteadyType™ ergonomics, PerfectPaint glide system, easy assembly (as well as a factory pre-assembly option), low cost, extra base color options (black, silver, and white), industry-leading warranty, extremely quiet operation. Users over 5’11” should upgrade to the XT base (+$100) for extra height range. Note: users over 6’2” can also add 6” height extenders (+$59) to the XT base, a very popular option for extra-tall users that is only offered on iMovR electric standing desks. The iMovR Freedom™ standing desk line is what the market has been waiting for – a quality American-made option that is priced competitively with popular standing desks built on commodity imported bases. The Cascade is identical in every other way to iMovR’s more conventionally-topped sister product, the Energize, but builds in their patented SteadyType™ keyboard tray for the most ergonomically advanced standing desk experience on the market. Toss in the litany of customizable options iMovR is known for (over 5,400 variants on the Freedom desk line alone can be ordered online), and here is a desk you can cater to your needs and count on for years of reliable, stable, and quiet operation. iMovR’s new entrant into the competitive standing desk landscape is its Freedom line, a series of high-performing all-American-made desks designed to eventually replace their Olympus, Uptown, and Upsilon models. The latter models are built on top of the high-quality, albeit imported, UpStage base. iMovR’s Freedom Line was designed primarily to challenge aggressively priced imported desks head on, and it delivers superior quality and performance than any imported alternatives we’ve tested, at a comparably low price point. If you’ve been shopping for desks like the UpLift, Jarvis, GeekDesk – all examples of standing desks built upon the popular Jiecang base – but have concerns about the quality reputation of these Chinese-made bases, the Freedom line offers better performance for the same money, with the ten year warranty and local support that comes with being entirely made in the US. To be fair, all of these desks will perform better than the super-cheap, super-commodity Autonomous Smart Desk products, but at the $600-$800 tier, the Freedom line (the Cascade desk, reviewed here, and the sister Energize desk with conventional tabletop) is going to be your best bet for the money. The Cascade is the most ergonomically advanced member of iMovR’s Freedom Line. It boasts iMovR’s patented SteadyType™ technology built into its tabletop, for optimal typing ergonomics while you stand (or walk, if you have a treadmill). The basic concept is that while you’re in the upright position (either standing or walking), the most ergonomically neutral, non-straining position for your arms is akin to the posture of a sleeping astronaut ­– with elbows bent not at 90 angles like most standing desk advertisements show, but with your arms resting closer to your sides and your elbows at wider angles, typically 115 -140 degrees. 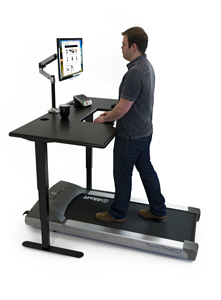 The difference with SteadyType™ is even more pronounced while walking at a treadmill desk and working. That’s because while walking, you tend to put more pressure (anchor stresses) on your wrists, bracing yourself on the desktop while keeping your fingers in position over the keyboard. The SteadyType’s negative tilt eliminates the need to brace and allows your wrists to rest naturally while you type for strain-free productivity. 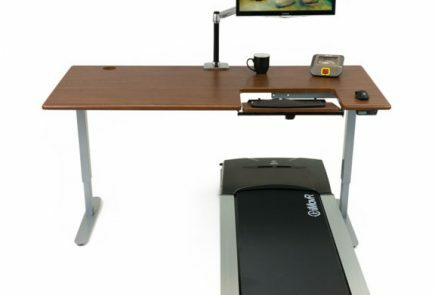 The Cascade is available from iMovR in a treadmill desk version we’re also reviewing. But the basic ergonomic advantage applies to standing as well as walking – the more closely you can emulate a purely neutral ergonomic angle while typing, the less strain you’ll place on all the muscles in your hands, wrists, arms, shoulder, and neck, and the more proficient and error-free your typing will be. So how does the Freedom Line meld top-notch quality and low manufacturing cost to outperform its imported competitors? As singer Meghan Trainor would say, it’s “All About That Base.” Machining all the parts that go into a lifting column and desk frame is very labor intensive, and that’s usually where you’d expect cheap Asian labor to win out over American manufacturing economics. However, the Freedom Line’s bases are manufactured in the United States using cutting-edge, extreme robotic automation techniques for finer machining tolerances and unmatched production efficiencies. These new automation techniques grant the base its consistent performance, impressive stability, and contribute to its low cost. Impressively, the Freedom bases actually come with the same warranty as iMovR’s top-of-the-line desks, the Energize and the Lander (lifetime on the frame, 10 years on dual, precision Bosch motors and electronics, and 5 years on 3D-laminated tabletop). This industry-leading warranty coverage is a testament to iMovR’s confidence in the high standards of its production process. Key to the Freedom bases’ excellence is the way friction was engineered out of the machinery, and key to that is its PerfectPaint™ glide system. The Freedom bases are weight-rated to lift 220 lbs, but after testing, we’ve concluded they can withstand more real-world weight than seemingly higher-rated Chinese competitors. Why? When linear actuators (the desk’s lifting columns) are machined to sloppy tolerances, they must overcome greater side-load stress and friction in order to raise the desk (learn more about this in our article on Do Weight Lift Ratings on Electric Standing Desks Really Matter?). Sloppier tolerances also lead to faster wear and tear on the delicately thin components that keep the actuator tubes separated, ultimately leading to a desk that becomes shakier and more likely to fail prematurely. The point is, when testing real-world loaded conditions – with monitors and monitor arms, computers, and other desktop accessories distributed as they normally would be across the tabletop, (i.e. with most of the weight toward the back edge of the desk) – a precisely-machined base with a 265 lb weight rating will outperform a sloppily-machined imported base with a much higher weight rating. When we lab test these competing products, we always use real-world conditions because Asian manufacturers famously publish their performance specs under ideal conditions – in this case with all the weight evenly distributed across the centerline between the base legs. The PerfectPaint glide system in the Freedom bases ensures the legs operate in a smooth and seamless fashion, raising the desk with minimal friction and no scratching. The difference is visually obvious when comparing the Freedom Base side-by-side against most any low-cost Asian competitors’ base. The low-cost Asian bases tend to exhibit dirty grease marks on the inner tubes of their lifting columns over time. (At their worst, they may even drip oil from underneath the feet.) This is one reason you won’t often find them available in white, or if you do, user reports of ugly black streaking along the legs are not uncommon. Internal to the leg column, most manufacturers use plastic end caps to stop the individual leg segments during the lifting process (so one telescoping tube doesn’t become unattached from the others). But the Freedom bases have eliminated these costly parts by precisely pinching the tube ends to serve the same purpose, giving their legs’ tube ends a distinctive look. This may sound like a relatively inconsequential nuance, but glide systems and end caps are crucial to keeping your desk in healthy working order for the long haul; they play an important role in keeping down the wear and tear on your base, and ensure many years of reliable and stable use. While most competing desk bases come in black or gray, the Freedom adds a sleek white color option to the mix, so you can create a desk with a characteristically modern “Apple-esque” or Scandinavian look to it. Its transit speed of 1.5 inches per second along with its whisper quiet motors outperform competing Chinese bases. Anti-collision sensing is built-in, along with acceleration and deceleration damping for ultra-smooth transitions from sitting to standing. It’s nice not to have your coffee slosh out of its mug when changing desk height. The digital LCD controller displays height in inches or centimeters, and the Up and Down buttons cleverly double as sitting and standing height memory presets so you can quickly raise and lower your desk to your saved positions. While this minimalist approach leaves the Freedom desks with a less glitzy-looking controller, the truth is most people only use two of their height presets, and all you really need is two buttons to accomplish this. The one downside of the Freedom controller is that to save on some cost the hand controller uses a cheaper reflective LCD (not backlit) for height reading display, rather than a bright LED. Since you’re not likely to ever look at it again after programming your height presets, we don’t imagine this is going to be a big deal for most users. Plenty of popular electric desks have no height read-out display at all, for that matter. Over the last few years, iMovR has developed a reputation for customizable desks, billing itself the “Dell” of office fitness with literally thousands of different desk and table configurations, and an on-demand, mass-customization product line. With the Freedom line, iMovR continues this legacy. Although the Cascade version doesn’t boast as many choices as its sister product, the Energize, it still has the rest of the market beat when it comes to base options, tabletop shapes, sizes, and colors. The Freedom line overall has over 5,400 different desk combinations between base options, base colors, top dimensions, top shapes (including a variety of corner options), top thicknesses (for modern versus traditional look), and top colors (eleven are standard, plus hundreds of custom color options). Other desk manufacturers offer a relatively minute number of customization options because they have to mass produce their desktops and keep them in inventory, so size, shape and color options are always going to be more limited as compared to any iMovR desk offering. Another nice benefit to having all these tabletop choices is that if you ever move or remodel, swapping out the top for a different size, shape, or color is a breeze. All iMovR tops come pre-drilled for easy assembly, and the thicker “Select Tops” use insert nuts and machine screws for attaching them to the base. This creates a stronger connection and also means you can disassemble and reassemble the desk many times without ever worrying about degradation of the screw holes. Every desk in the Freedom line, including the Cascade, comes with the option for a standard base or an “XT” base. The standard base has two leg segments and a smaller height range (25.7” – 43.8” not including tabletop, and with leveling feet fully closed). It’s the most economical option for shorter users, under 5’11” or so. The XT base comes with three segment legs and a greater height range (21.3” to 47.4” not including tabletop, and with leveling feet fully closed). iMovR recommends the XT for users over 5’11”. Important to note, though, is that for users 6’2” and taller, there are 6” height extenders available for the XT base. Our 6’7” co-worker is able to operate comfortably on an XT model with the 6” height extenders installed. If you want to squeeze even more height into the base, you can also add optional caster wheels, which will prop the desk up another 2.5 inches. These extenders are essential for most treadmill desk users, as they will be 5” taller when standing atop an office treadmill like the iMovR ThermoTread GT or Lifespan TR1200. The height extenders (only $59 when purchased with the desk) also enhance the stability of the desk by increasing the overlap area at the ends of the three leg segments of the XT base. 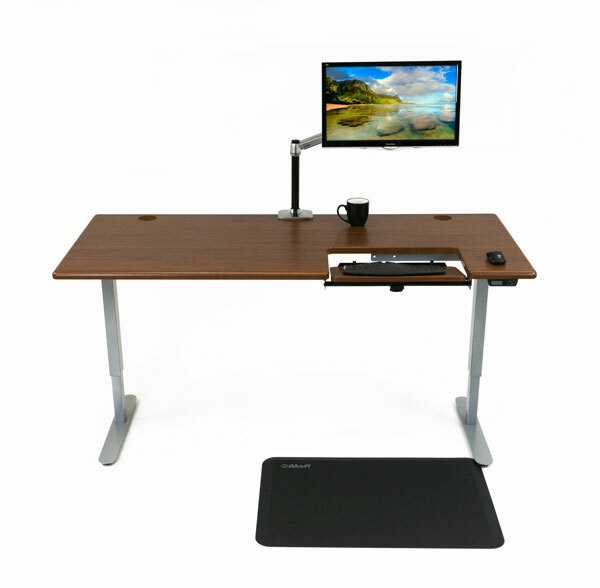 iMovR is the only standing desk manufacturer so far to offer leg extenders on all its made-in-USA electric desk models. Just one more of the many things that separates them from the cheaper commodity desks you’ll find heavily advertised online. 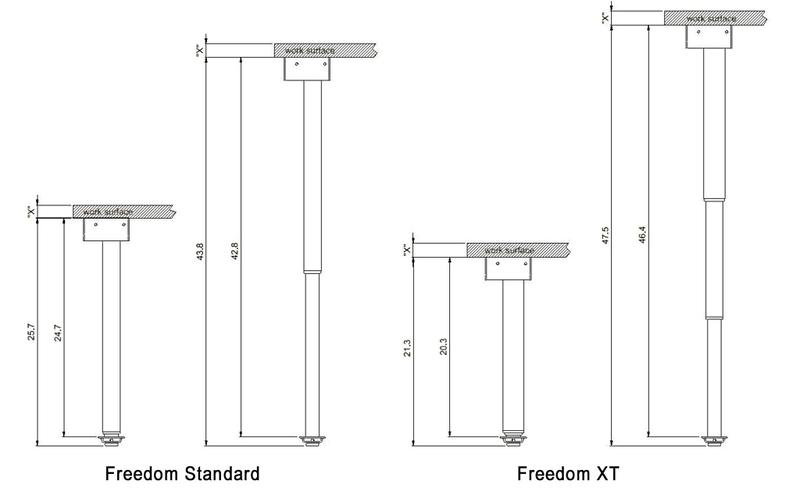 Both the standard and XT Freedom bases are UL 962 / CSA 68 certified, and the XT base model is ANSI-BIFMA certified 5.5 and 7.1. The Cascade, like all iMovR desks we’ve tested, comes in 16 different 3D-laminated finishes (and hundreds of additional custom colors are also available for bulk buyers). While most tabletops comprise a standard high-pressure laminated, powder coated or thinly veneered top, iMovR’s signature 3D lamination process hermetically seals around the MDF (medium density fiberboard) tabletop, making it impervious to moisture damage. It also allows the tables to achieve gently-sloping edges and rounded corners for a more comfortable top than standard standing desks⏤what iMovR dubs “ergo-contouring.” You can see their website if you’re curious to learn more about the advantages of 3D-lamination. The Cascade, along with the Energize (its close relative, minus the SteadyType™ keyboard tray), comes in corner shapes as well as standard rectangular shapes. The corner options are two-legged, easier to install than most 3-legged L-desk behemoths, much easier on the wallet, too, and feature a flat back edge to make monitor arm installation easier (and at the correct focal depth). [Editor's update: the exception to the rule is iMovR's new Lander L-desk which installs in under ten minutes with just a screwdriver.] Interior designers love that they can combine these corner desks in a variety of patterns (honeycomb, quads, back-to-back) to optimize space in the large open workspaces that are so popular these days. How does the Freedom Line compare to iMovR’s Lander desks? As soon as your desk arrives at your door, the differences between the Energize and the Lander become most apparent. This is because the Lander ships almost completely pre-assembled while the Energize does not. The assembly process for the Energize desk is still better than its imported competitors, who tend to feature confusing, minimalist instructions. It's also nice that you don't have to use power tools to assemble the Energize, as the holes are all pre-drilled (though it does make the process faster to use a power drill). However, the assembly of the Lander is even easier, as it only requires you to snap in the legs to the tabletop, which features pre-mounted sockets. It's a "snap" to assemble the Lander in minutes, without tools, while the Energize is closer to your standard furniture assembly experience which could take around 30 minutes, albeit with more complete instructions than most. Once they're assembled, the Lander desk features, in general, higher specs across the board than the Freedom, at the expense of less customization options and a higher pricetag. Both desks are high-quality made-in-America products, but the Lander is designed to go the extra mile with a higher lift capacity and faster travel speed. These are nice upgrades to have, but they aren't really key differentiating factors that cause buyers to shell out extra cash. The Lander also features a greater height range out of the box than the Freedom, with a taller maximum height of 50.5". Height extenders and caster wheels allow you to go even higher, meaning that the tallest users (over 6'7"), especially those who use treadmill desks, should appreciate the Lander. But for the rest of us, the real reason that the Lander is an upgrade over the Freedom series is its controller with Bluetooth app compatibility. The Lander desk features a paddle style controller, which is more intuitive to operate than the controllers on traditional desks. Simply lift it up to lift the desk or push it down to lower it. Aside from being easier to operate, the desk will also pair with a free smartphone app for iOS or Android that allows users to control the desk with their phones. On the surface, this doesn't seem like a game changer—why would you ever want to change the height of your desk remotely? You'd be right to wonder about that, as the benefit of the smartphone app is a little bit more roundabout, and requires some understanding of ANSI/BIFMA regulations to appreciate. All ANSI/BIFMA certified height adjustable desks cannot operate without a user holding down the button on the controller to change the desk's height. This is a safety precaution intended to reduce the change that your desk, a heavy piece of machinery, accidentally crushes something. If you're required to keep your hand on the button to move the desk, you can simply take your hand off to stop it. This was decided with the best intentions, but with advancements in standing desk design eschewing the "knee-crushing" crossbars, the chance of your work surface actually colliding with something (or someone) with enough force to cause damage is slim, especially since both the Energize and the Lander feature anti-collision technology built-in. Most users would rather have the functionality to raise or lower their desks with one touch, as opposed to having to hold down the button for several seconds. Now back to the app. The Lander's Bluetooth-compatible app makes it possible to control the height of your desk with a single button press, without sacrificing the ANSI/BIFMA certification that most corporate purchasers require. This is because the app features a liability waiver—if you click "accept" on the waiver, you gain the ability to control the height of your desk with a single tap, a convenient feature that just about everyone who uses a standing desk will appreciate. The app also allows you to set reminders on when to stand, which can be useful for first time standing desk users. To summarize, the Lander features an easier-to-use controller, an app that allows one-touch height adjustment, and higher specs, with a higher price tag and less customization options available. The Freedom is a great deal for those looking to buy made-in-America, while the Lander is more of a premium product. In a market facing cost pressures from abroad in the form of cheap, poorly-made imports, the iMovR Cascade Standing Desk stands out as a high-quality American-made alternative with a variety of customizable options, state-of-the-art ergonomics, and an impressively low price point for a domestic product. Its SteadyType™ technology, patented by iMovR, is the only method on the market for ensuring neutral ergonomic posture while typing (costs about the same as adding a conventional high-quality adjustable keyboard tray), and its industry-leading warranty is the best you’ll find in its price tier. If you’re looking for a Made-in-America standing desk with top notch ergonomics, a reasonable price point, and middle-to-top tier specs, the Cascade Standing Desk from iMovR is one not to miss. See more of iMovR’s products in our comprehensive standing desk comparison review. For user reviews of iMovR standing desks, see the testimonials page on iMovR.com. Cascade desks are made to order and arrive within ten to fourteen business days from order placement. They are shipped palletized by freight from Grand Rapids, Michigan. The standard shipping price for Cascade desks, including all optional items purchased at the same time, is free. iMovR also offers a variety of delivery upgrades including room of choice delivery and, uniquely, factory pre-assembly. The iMovR Cascade has an excellent warranty: Lifetime on the frame, 10 years on moving parts and electronics, and 5 years on the tabletop. Available Sizes 47" x 30"
Rated Lifting Capacity 265 lbs. 265 lbs. Product Weight 60 lbs. 66 lbs. Check out our comprehensive Comparison Review of Electric Standing Desks.